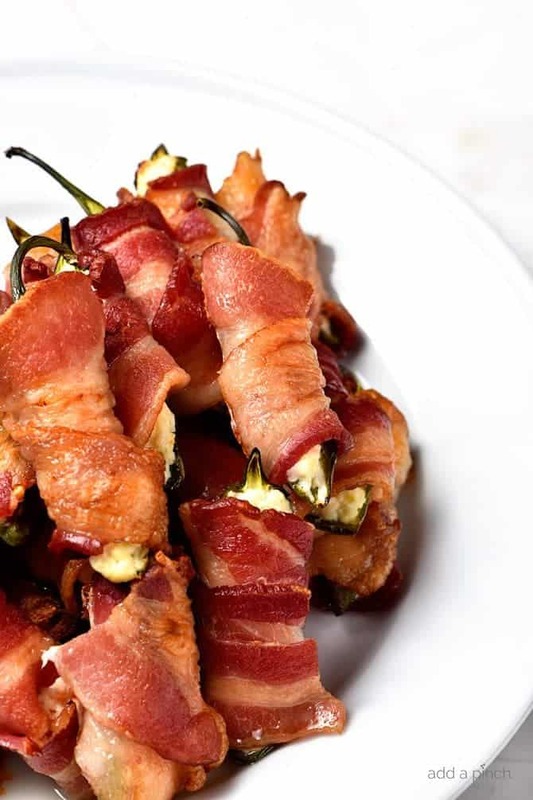 Bacon Wrapped Jalapeno Poppers make an appetizer that everyone loves! This easy recipe combines creamy cheeses, spicy jalapenos and crispy bacon for classic baked jalapeno poppers that are irresistible! These jalapeno poppers are one of those appetizers that when you make them, you can always depend on them being devoured. 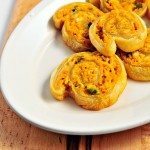 With just a few ingredients, you can have these babies ready for serving in just a jiffy. We’re gearing up for a long weekend filled with football games, birthdays, and hanging out with family and friends. While I was planning my menus for the weekend, one appetizer kept making it onto the lists – these bacon wrapped jalapeno poppers! There are so many reasons that I love these things so much, but right at the top of the list is that everyone loves it when you pull these out for serving. They are always gone in a flash! I also love that since our jalapeno pepper plant is still producing like wildfire, I have a great way to use all those peppers! Making them couldn’t be much easier either. You slice your jalapenos in half lengthwise. I always like to leave just a little bit of the stem of the pepper as a “handle” for serving. It also makes it pretty apparent when they are served that they are peppers so that everyone knows. Once you slice your peppers, remove the seeds and the white membrane from them. Next, grab a knife and fill each of your pepper halves with cream cheese. Make sure not to overfill your jalapeno halves as it will ooze out when they bake! 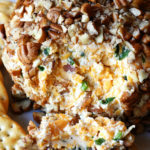 Some like to mix up a blend of cream cheese and cheddar cheese for the filling. 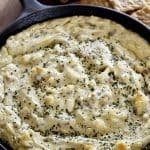 If you prefer to do that, mix your cheese together in a bowl until well blended and then spread the mixture into the pepper half. Either way is delicious! Repeat until all of your jalapeno halves have been stuffed. Then, you’ll want to prepare your bacon. You’ll want one slice of bacon for each whole jalapeno. 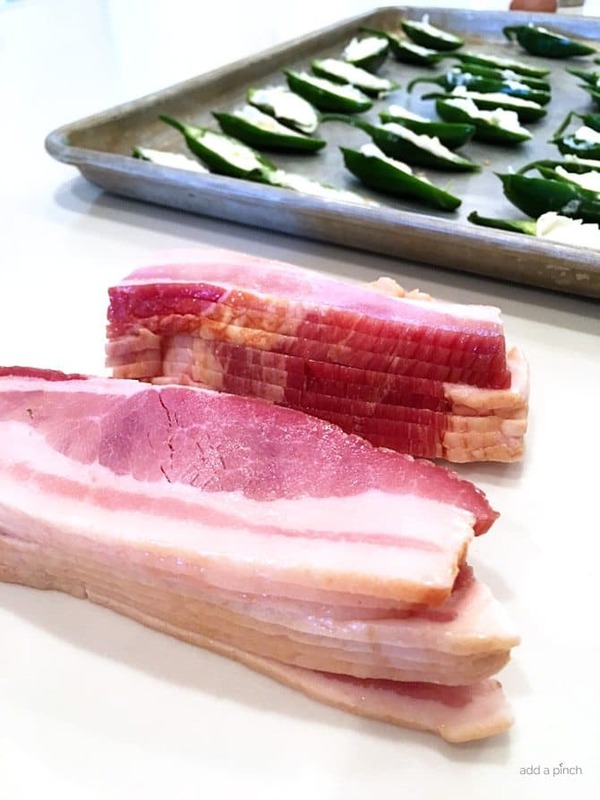 Then, cut your bacon in half so that you have one piece for each jalapeno half. I like to use thick cut bacon, but use whatever bacon your family enjoys. 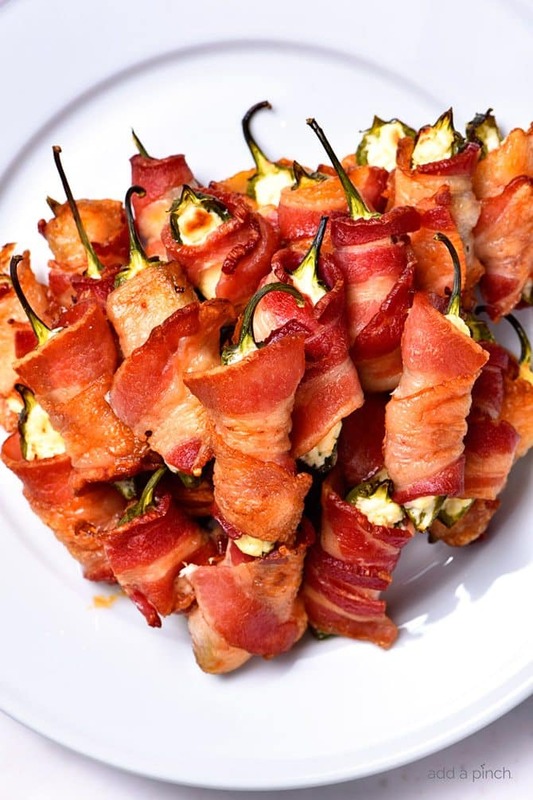 Then, wrap a bacon piece around each of your stuffed jalapeno halves. You can secure your bacon with a toothpick if needed, but I have found that the bacon stays fairly well when you wrap it tightly around the jalapeno half and that the toothpicks aren’t really needed. Once wrapped securely, put onto a rimmed baking sheet and repeat until all halves have been wrapped well. 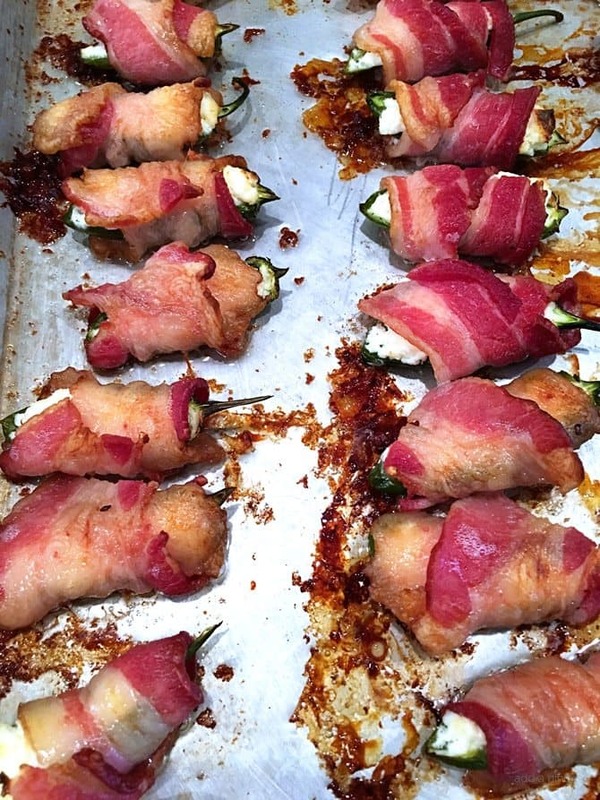 Bake your jalapeno poppers until the bacon is cooked through and crispy. Remove from the oven and allow to cool about 5 minutes before serving. You can also assemble your jalapeno poppers ahead of time to make game day or entertaining even easier! Just proceed through the recipe up through wrapping your stuffed jalapeno peppers with bacon and placing onto the rimmed baking sheet. If you are going to serve them within two days, just wrap tightly with plastic wrap and store in the refrigerator. If you plan to serve them after more than two days, I recommend freezing them. Just place the baking sheet in the freezer to quickly flash freeze the assembled poppers. This should take between 15 to 30 minutes. Once they have frozen, you can transfer them to sealable freezer bags for longer term storage in the freezer or leave them on the baking sheet if you plan to bake and serve them soon. 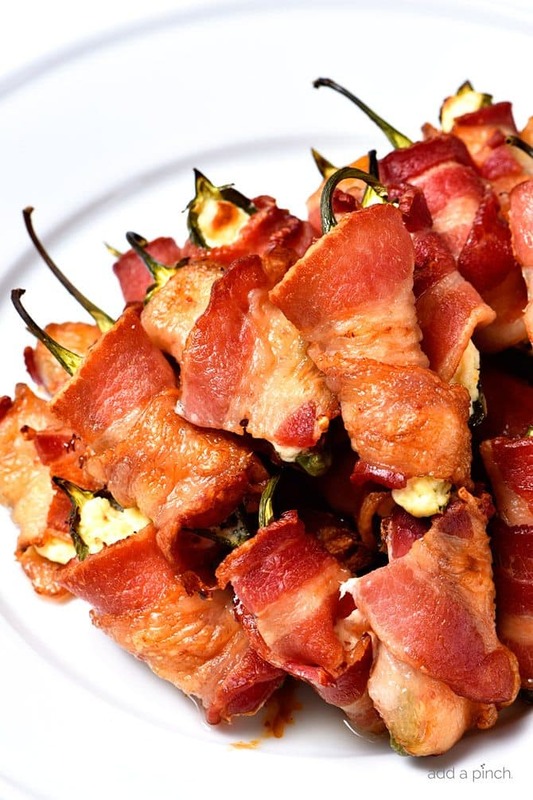 Here’s my Bacon Wrapped Jalapeno Poppers Recipe, including the make-ahead and freezer instructions. I hope you love them as much as we do! 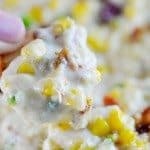 If you love these flavors, you might also love my Jalapeno Popper Dip, Pimento Cheese Jalapeno Poppers and my Jalapeno Popper Chicken! Delish! 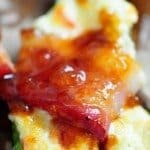 Bacon Wrapped Jalapeno Poppers Recipe - Bacon Wrapped Jalapeno Poppers make an appetizer that everyone loves! This easy recipe combines creamy cheeses, spicy jalapenos and crispy bacon for classic baked jalapeno poppers that are irresistible! 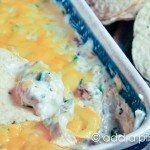 Fill cleaned jalapeno half with cream cheese (or cream cheese and cheddar mixture). 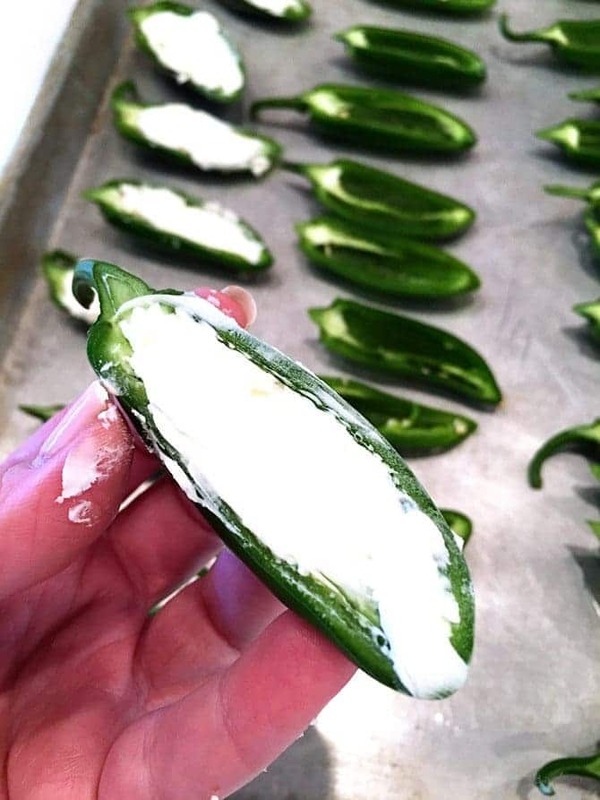 Be careful not to overfill as it will ooze out of the jalapeno poppers as they bake. 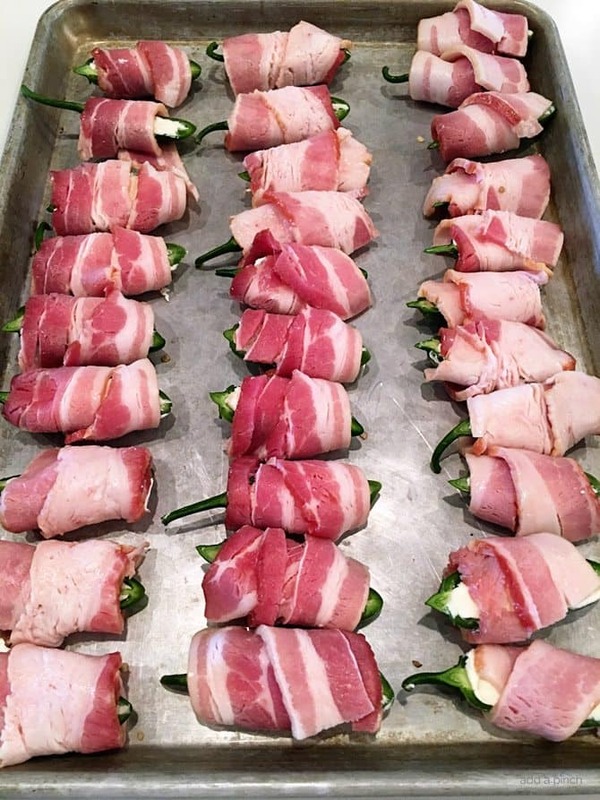 Wrap each stuffed jalapeno half tightly with a piece of bacon. Arrange on a rimmed baking sheet and bake until the bacon is cooked through and crispy, about 15 minutes. Remove from the oven and allow to cool about 5 minutes before serving. Prepare jalapeno poppers by assembling without baking. Wrap the baking sheet tightly with plastic wrap or foil and store in the refrigerator up to two days. To serve, remove from the refrigerator and bake as directed. You may need to increase baking time by a few minutes since the jalapeno poppers are cold. Prepare jalapeno poppers as you would in the make-ahead instructions, but place into the freezer to flash freeze for 15 - 30 minutes, until individually frozen. At this point you can leave on the sheet pan or transfer to a sealable freezer bag for longer term freezer storage. 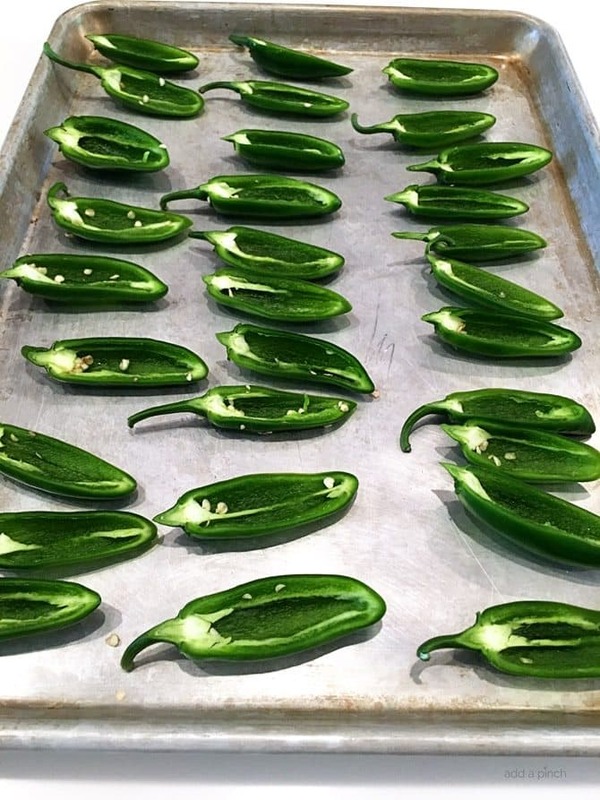 To serve, remove the number of jalapeno poppers you plan to serve from the freezer and bake as directed, increasing baking time to by about 10 - 15 minutes to account for baking from frozen. We absolutely LOVE these! The hardest part is convincing people they really aren’t hot when they see jalapeños. Once they try it they are sold! If you make ahead and freeze does the texture of the pepper get soft when baked? My only dislike is the mess the bacon makes in the oven from splatters but it’s worth it! Robyn: Are you cutting the bacon strips in half or length-wise? Photo looks like it is cut in half. OMGoodness gracious! These look DELICIOUS and I know I would love them. Yum, yum! And who doesn’t like jalapeno peppers, cream cheese or bacon!? LOL Thanks so much for sharing. These are so good. I have made them before but I have mixed a packet of dry ranch seasoning with the cream cheese! That is also delicious! Thanks for sharing! Oh this recipe is timely I gave so many jalapeños out in the garden I will make and freeze. Thank you. That’s what is on my agenda this weekend, too! I hope you enjoy them! Just made your jalopena poppers. Have not baked them yet, but was curious as to how you split the pepper & had a “stem portion” for each half….I ask this because you stated that you like to leave on a stem so people know that it is a pepper. Also, I made a few , halved them such that they were “little boats”, stuffed them then put the”lid” back on..I proceeded to wrap in bacon..THAT is the only way each popper would have a stem…suppose it is no longer a popper! LOL! Does anyone have problem with bacon getting crispy? I have electric oven. I have tried different methods. Maybe I’m just not patient enough. Lol. But tried on baking sheet, on wax (parchment) & baking sheet, on rack, on rack & baking sheet, pre-cooking bacon then wrapping (best method so far) but bacon doesn’t seem to crisp very well. How many poppers is a serving? These are great! I’ve had that problem too. A friend made a brilliant suggestion. Half cook the bacon in the oven first. I cook it on heavy duty foil in a baking sheet. Works perfect. Thank you very much for sharing.I am getting ready to go to the market and buy the ingredients to make this delicacy. It happened that my dear neighbor make some Jalapeño poppers came to my house knock on my door to just give me one, just one, so that I could try it, they were great, first time I ever tried it and I am Latina, I love Jalapeños. I wish he would of given me at least 3, but is all good because thanks to this recipe that you have shared now I am the one that is going to get STUFFED.